Dining at Bouley is quite a delightful & delicious experience. 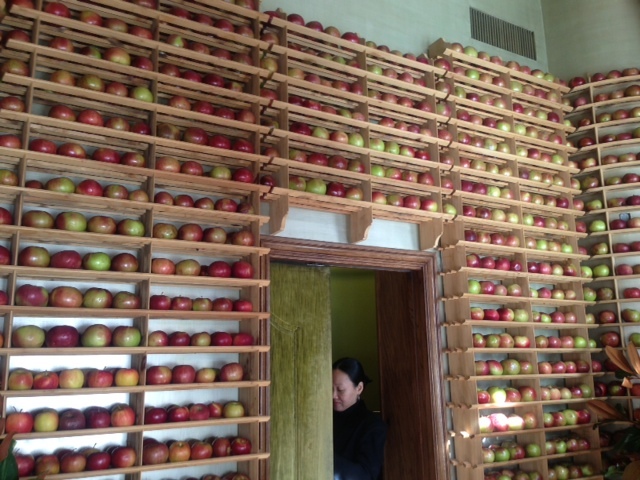 When first walking in, you are greeted by coat check and the wood paneling filled from top to bottom with red and green apples, which gives off a sweet, crisp wonderful scent. Upon entering the actual restaurant, you are transported into a world of elegance and splendor. 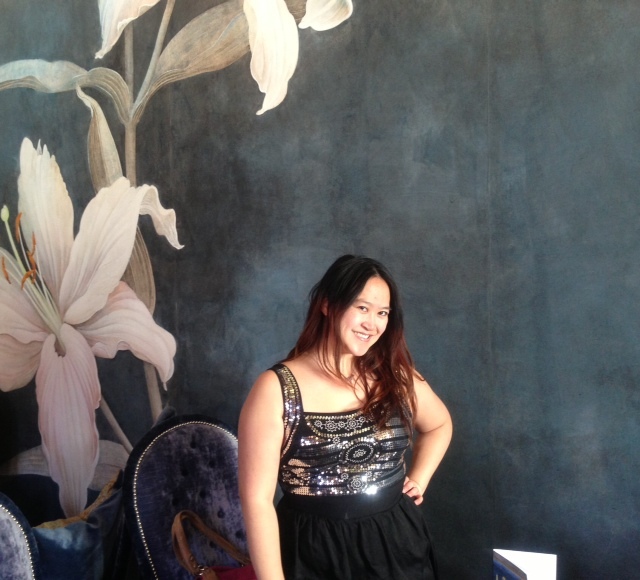 There are plush dark velvet blue seats, walls painted a lighter blue, bordered with beautiful white lilies. We are given two pieces of bread to start with. I liked the one with apple and raisin- Soft, sweet and tasty. Then came two amuse-bouches that were oh so good. The first, a pink concoction that tasted of watermelon puree and had a sprinkling of sesame seed and brittle, a bit of cream and the surprise taste of smooth, flavorful cheese at the bottom. The other bite was truffle on top of a savory, wonderful sauce and thin cracker. 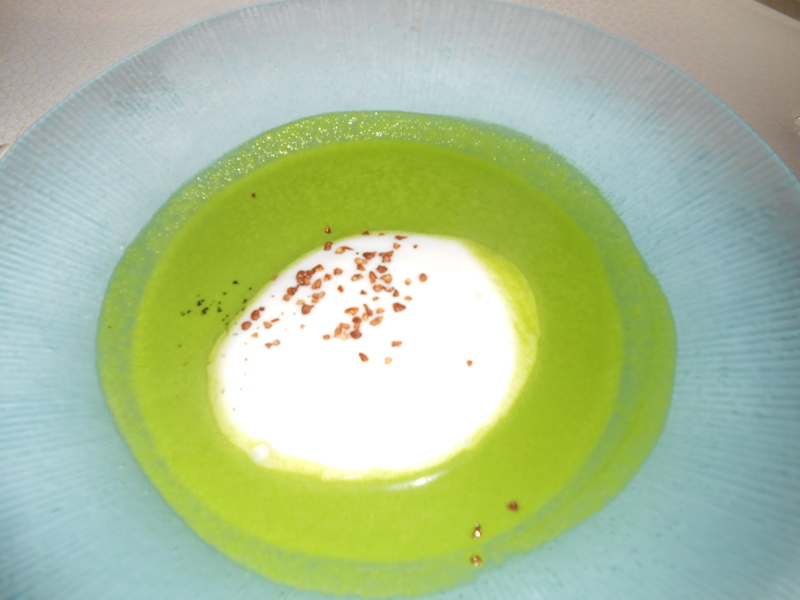 Next, was our appetizer and I ordered the chlorophyll soup, which came bright green and was made out of kale, spinach, sweet peas, asparagus and other green ingredients. It was hearty, savory creamy and full of flavor. Before our next course, along came the famous bread cart, complete with around 10+ different types of bread. I enjoyed the rosemary and garlic, as well as the one with blackcurrant. 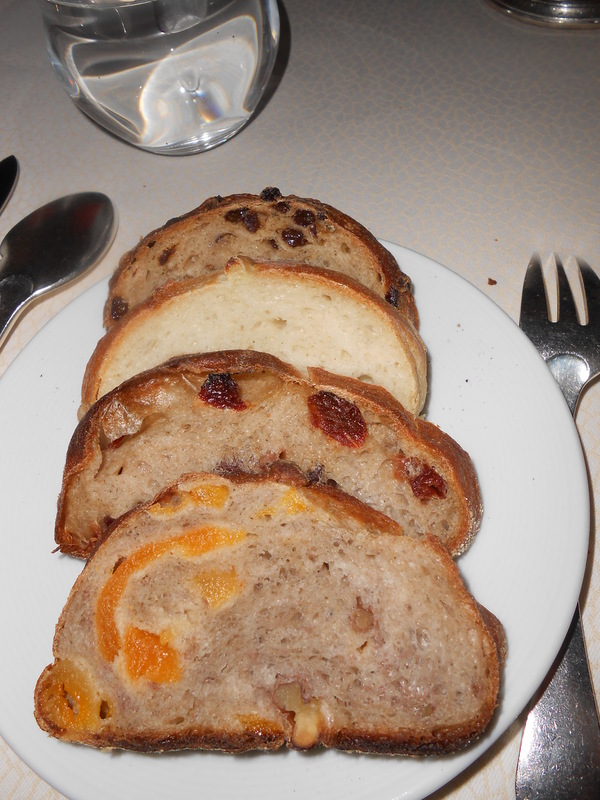 There was also a special one that is a combination of 3 different types of bread. All of it was delicious, but dare I say, too much bread! 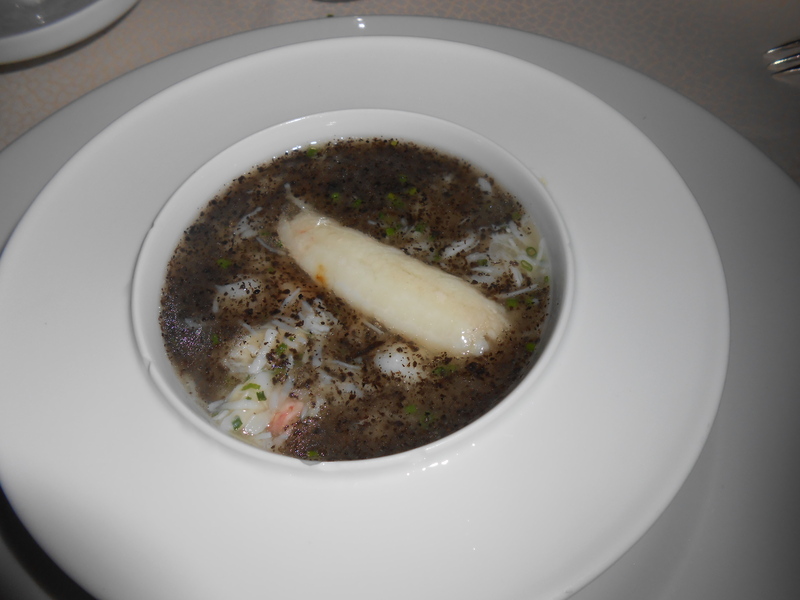 I had to try the Porcini Flan (one of Bouley’s most known dishes), which consists of Alaskan Live Dungeness Crab and black truffle dashi. The dish may not look like much in the image below, but the flavors here are incredible and the crab extremely tender and delicious. The black truffle and egg custard add to the taste and everything combines together beautifully. 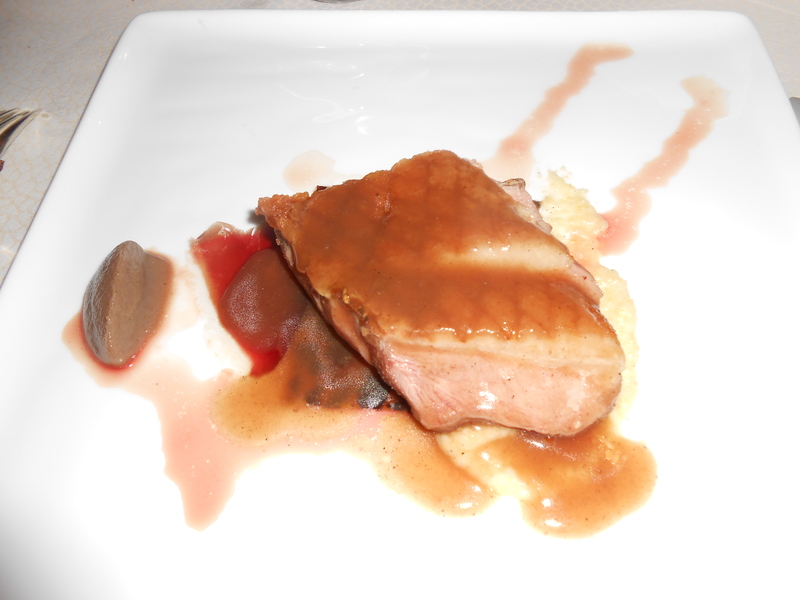 The next course was organic Long Island duck, which came within a sauce of Hudson Valley organic hand milled polenta and confit of young organic clementines. The duck was cooked to perfection and the sauce was sweet and worked well with the duck. I did not like the dates with prosciutto cooked in duck fat on the side though. I also tried the beef cheeks with blue kale gnocchi. 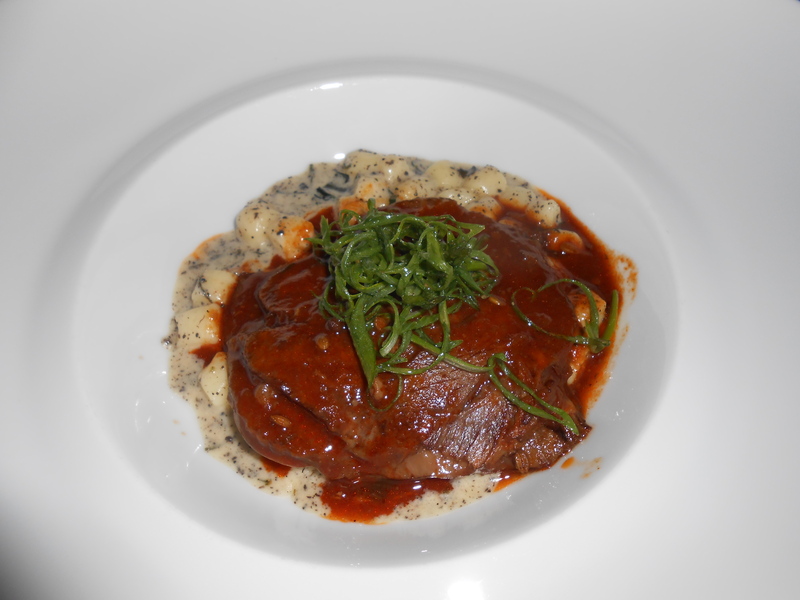 The beef cheeks were slow braised kobe style and quite good- A bit spicy but not too much. The beef was tender, full flavored and the gnocchi were creamy and delicious. I actually liked this dish better. 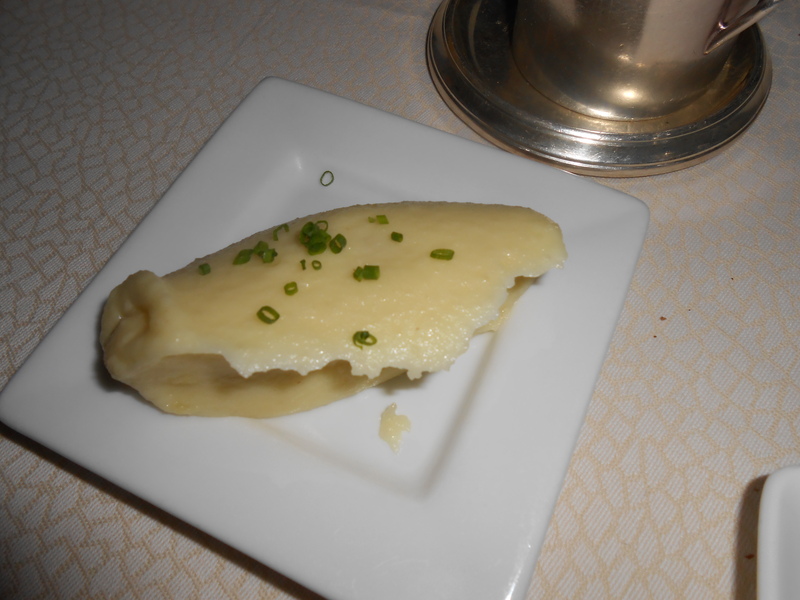 We were given a little taste of fingerling potato mash, which was fresh made, still warm, velvety smooth, fluffy and had the yummy taste of potatoes and butter. Next, came our first dessert. 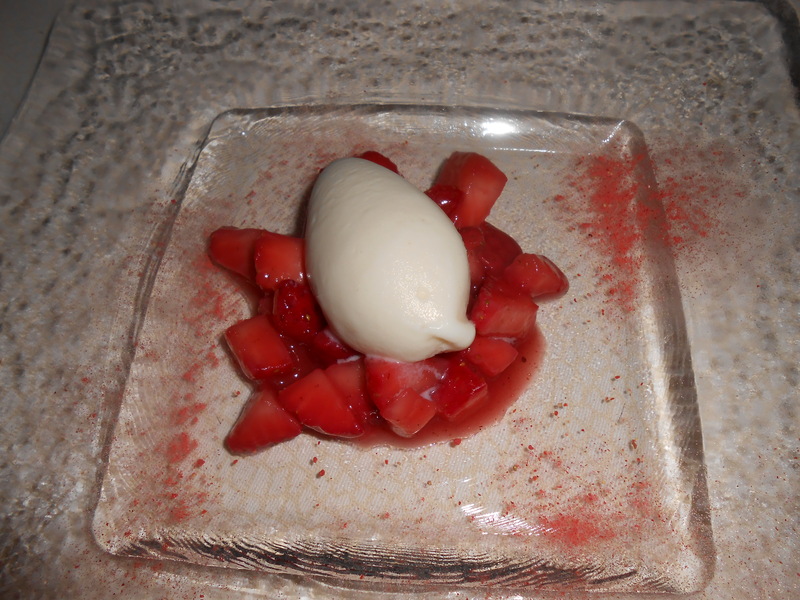 I had the strawberries with amaretto ice cream. The flavor of the amaretto ice cream was intense and wonderful. The fruit, very sweet sauce and ice cream worked well together. 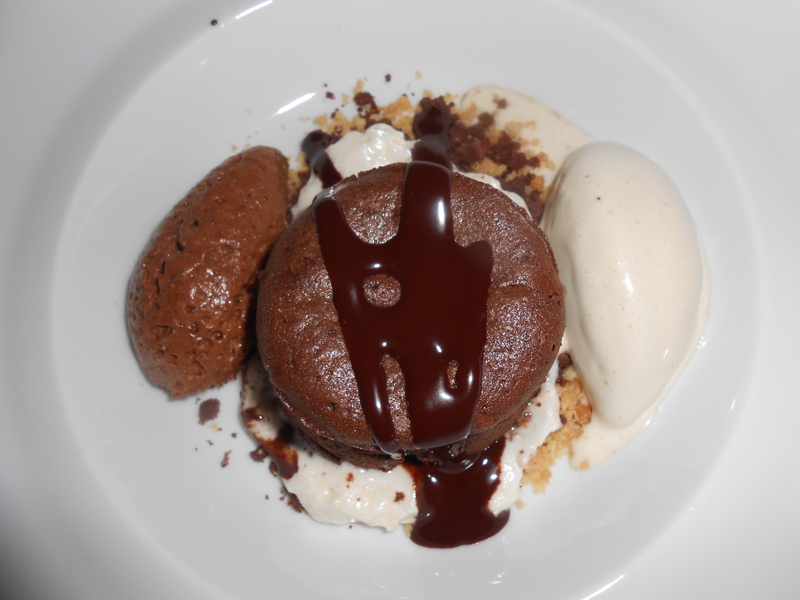 The final course was hot Valrhona molten cake with chocolate mousse, white chocolate ice cream and it was simply divine! 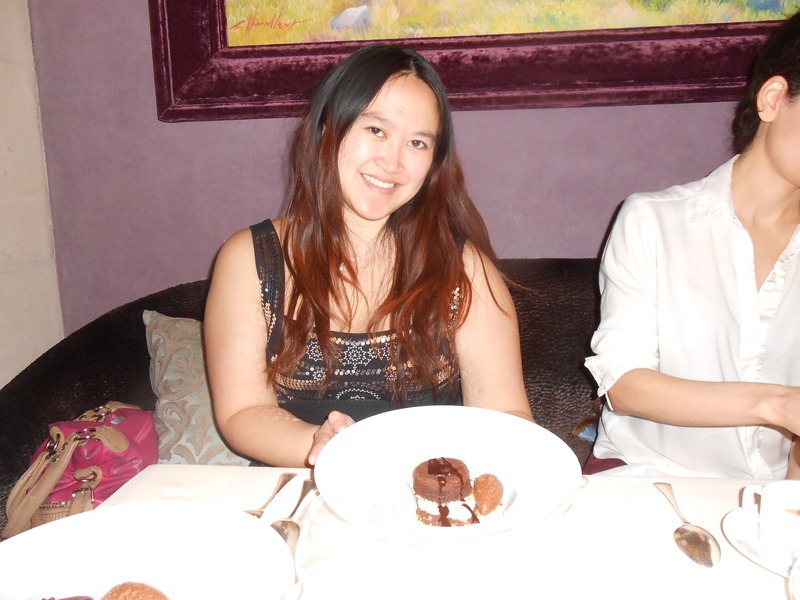 The chocolate was indeed hot and oozed out of the souffle cake. It was full of rich chocolate flavor, perfectly velvety smooth, and just so darn delectable. The ice cream wasn’t all that flavorful and I could have done without the mousse, but the cake was good enough to stand on its own. 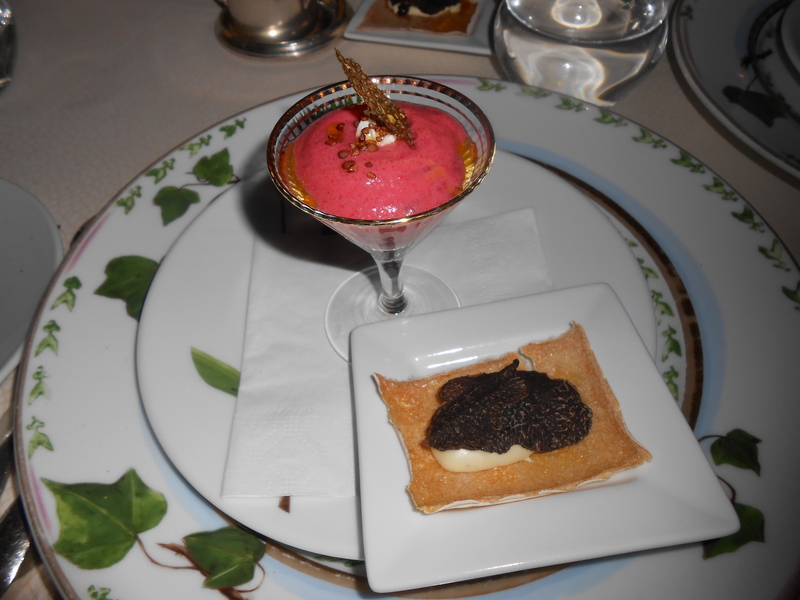 If this was the only course I had at Bouley, I would have been satisfied…. That’s how good it was. 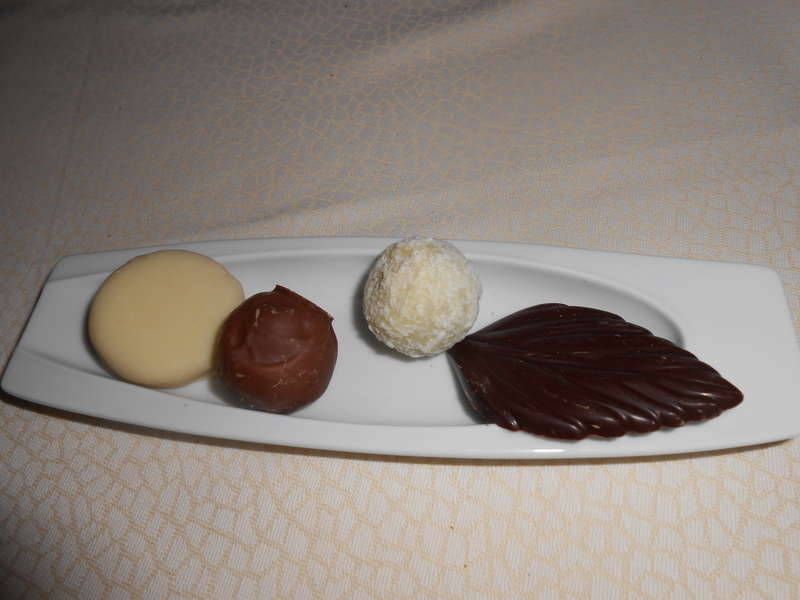 We even got to try some truffles and chocolate which was so sweet of Bouley! This luncheon tasting meal will go down in history as one of my favorite meals ever. And it’s such a steal at $55, especially compared to the $175 6-course tasting menu for dinner. Also, the service was impeccable. Such a beautiful restaurant (now one of my favorites) with little treats in between courses, more bread than you can handle, with an elegant (jackets-required), but not pretentious atmosphere.